Classic and extraordinary fencing of wood, ornamental picket, chain link and vinyl are offered using time-honored designs and creative new concepts with contemporary flair. 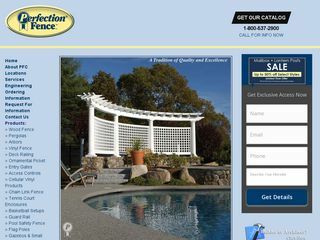 Recognizing the potential and value of maintenance free vinyl, Perfection Fence Corp.® introduced ForeverVinyl™ fencing with the same visual appearance as wood. This milestone earned us national recognition as we became rated the Best in the Industry!